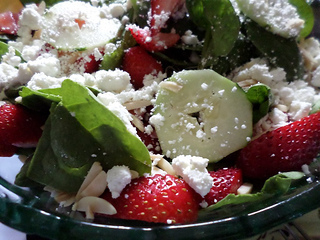 This strawberry spinach salad recipe is one of our favorite cold salads. It's colorful and pretty to serve and tastes so refreshing. Here is my variation of it. The mix of the two greens gives a lighter more refreshing flavor. 1 Cup of Toasted Almonds (put raw almonds in the oven at 300 degrees for about 10 minutes). Add the toasted almonds just before serving. Poppy Seed Dressing - I do not put it on the salad, but rather in a bowl with a ladle and let the guests put on their own dressing. To save time so that you can spend more time at the pool buy your poppy seed dressing. The Naturally Fresh brand can be found in the refrigerated section of the grocery store and tastes great. 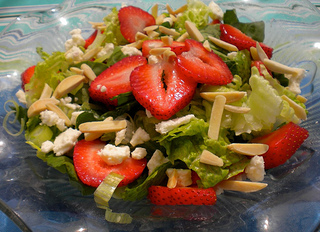 This is such a nice light salad to serve for any pool party. It looks pretty and is easy to make. Make the salad big because everyone will want seconds. We served this at a recent pool party with out of town company. Hardly a piece of spinach was left. Serve with poppy seed dressing. 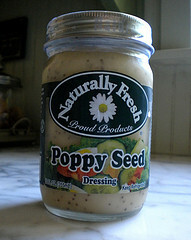 We used the Poppy Seed Dressing by Fresh Market. 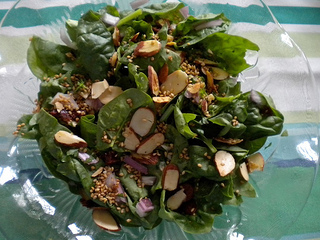 Sprinkle the toasted sesame seeds and slivered almonds over the salad just before serving. Let your guests add the dressing to their liking.